Standard Pitch - no electric or services. Serviced Pitch - electric and TV hook-ups (tents). Multiserviced Pitch - with electric, TV and water hook-ups, and grey waste disposal (caravans and motor caravans only). Minimum nights may apply during some periods. Payment by the following credit cards is accepted . A non-refundable deposit will be required to secure a booking. The proprietor is letting and the client is taking a touring site for the period of hire shown overleaf and upon the terms and conditions set out in this agreement. To pay the proprietor the payments specified overleaf and any balance on arrival To be responsible for and indemnify the proprietor against any loss of or damage howsoever caused. To comply with the Site Rules set out below and to ensure that any other person occupying the Caravan /Motor Caravan /Tent complies with the site rules. To indemnify the proprietor against any loss or damage caused by non- signatories to this agreement who are occupying the unit. So long as the clients observe the terms and conditions of this agreement the proprietor will permit the client to occupy the touring site. Unless otherwise agreed in writing the client will not be entitled to any abatement or refund of payment in the event of departure before the date booked. The proprietor accepts no responsibility for consequential loss or damage however arising from the letting evidenced by this agreement. Should the client fail to make the payments referred to when due or commit any other breach of this agreement, the proprietor may terminate this agreement and upon termination the client will leave the site in an orderly manner. The client must report to the site office on arrival to check in and settle the site fees before occupying a pitch. The latest arrival time is 9pm. Pitches should be vacated before 11am on the morning of departure unless prior consent is obtained. Ground sheets in caravan awnings are not permitted (breathable ground sheets exempted). No loud music is to be played at any time. Noise that may cause a nuisance to the proprietor or other occupiers of the site shall not be made. The client shall not make any unnecessary noise between 11pm and 8am. Barbecues are permitted provided they are raised off the ground to prevent scorching the grass. They must not be placed on the wooden picnic tables. All barbecues to be extinguished by 10pm. Wood fires on barbecue stands are not permitted. Smoking is not permitted in the toilet blocks or in the holiday caravans. Hot and cold water is provided free for personal hygiene only and not for washing cars and caravans. A play-field has been provided for the playing of games. It is not permitted to play around the caravans, tents or toilets, nor is the riding of bikes, toys, skates or blades on the track permitted. Dogs should be exercised on the dog-walk or off the site. They must be kept under control and must not be allowed to foul any part of the site. Dogs should not he left unattended in caravans/ tents or cars especially in hot weather. The main gates of the site are locked to cars between 11pm and 8am. The Proprietor reserves the right to refuse entry, or eject from the site any person causing a nuisance or disturbance to the Proprietor or other clients on the site. 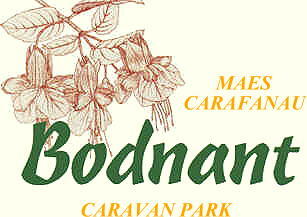 Content is copyright Bodnant Caravan Park, North Wales.